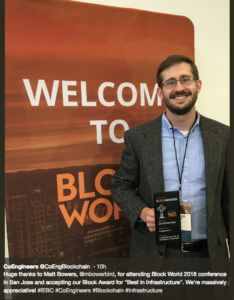 The IEBC is proud to share that we’ve recently won the “Best in Infrastructure” Block Award for CoEngineers.io at the Block World 2018 Conference held in San Jose, CA on September, 13th. 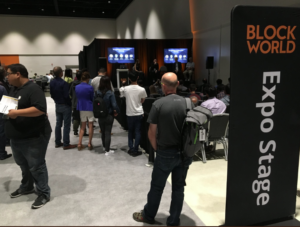 “The BlockAwards spotlight the technologies that enable the decentralization, and we believe Coenginers.io is a leader in their industry for enabling the next generation of decentralization. Blockchain is about more than just tokens, it’s about enabling new solutions that change how industries work. We’re excited that Integrated Engineering Blockchain Consortium can be a part of the technology shift!”, stated Geoff Domoracki, Founder of DevNetwork, producer of BlockWorld & the 2018 BlockAwards. The BlockAwards Ceremony is the world’s largest Blockchain Developer conference & expo, organizing the global Blockchain economy with over 3,000 attendees. Huge thanks to Matt Bowers of SC Solutions for accepting the award on behalf of the community. We massively appreciate everyone! Thank you.